Welcome to VK Barnet Volleyball Club! 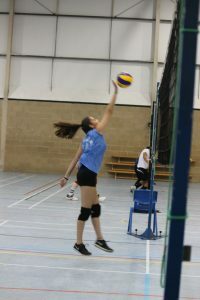 VK Barnet is north London's premier Volleyball club. We train indoors every Wednesday evening (September till June) from 8pm to 10pm at the Queen Elizabeth Leisure Centre, Barnet, North London EN5 5RR (click here for a map). 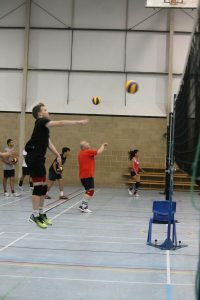 We are affiliated to the Hertfordshire Volleyball Association and we currently run two Men's teams one in Division 1, the other in Division 2, one team in the Ladies' Division and a Mixed team. For the first time Southgate Juniors are entering teams into the Volleyball England National Championships. See the Girls playing in U16 National Championships, winning against Richmond 25-19 and 25-18, then similar against Greenhouse 25-18 and 25-17. Due to play on Saturday 10th Nov in the Prelim round. Hopeful to qualifier to the next round. Due to play on Sat 8th December at Richmond. The 2017-2018 Volleyball Season has now finished. Thank you to all our players who have supported the club during this tricky season. Having had to move out of QE Girls School we have been welcomed into our temporary home at St Michael’s. Unfortunately the change of venue and night took a toll on training attendance and on the Men’s first team who struggled to complete the season. We are still hopeful of a September return to QE and will post updates on the Facebook group and page. Unfortunately there is currently no summer volleyball scheduled. 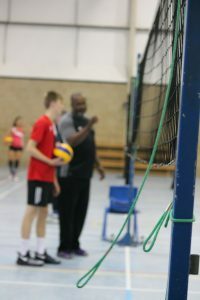 We are focusing on Core Skills and Match play development for the U18 Girls and U18 Boys Teams, playing in the Herts League Div 2 Men and also in the London Junior Grand Prix for U18 Girls. In the Spring/Summer the session will then develop the London Youth Games Teams for Enfield and Barnet. It is targeted at male and female 15-18 year olds who already have the core skills, and play intermediate level. There will be 2 courts, with separate Girls and Boys courts and coaching. Session cost is £5 for the 2 hours, pay the coach at the beginning of the session. This is invitation only, so you must attend the Open Tuesday Session 5.45-7pm for an assessment of suitability. You must still register with the club if you haven’t already. Contact Eric for any queries about joining the session. Welcome back to the new season. I hope you’ve had a great summer and are ready to get back to training. The VK Committee would like to thank you for your patience whilst we’ve been working to resolve the situation with the Hall at QE Girls School. Work has started on repairing the roof and we’ve been advised that the issues with the water have been resolved. We have everything crossed that we will be able to return to QE in the future. The first session is Tues 12th Sept. Unfortunately the Hall us not available to book on a Wednesday. The sessions will have a qualified coach and will be on a pay as you go basis. Each session at St Michael’s will be £8. There is no joining or membership fee. We will be entering a ladies team and a Men’s team into both Division 1 and 2 of the Herts League. We are looking for players to join our ladies team and Men’s first team with our second team being a development team for our junior section. Please follow our Facebook group for up to date information. 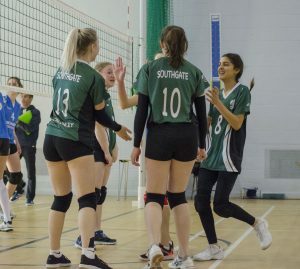 VK Barnet Volleyball Club are looking for new players to join both their ladies and men’s squads. 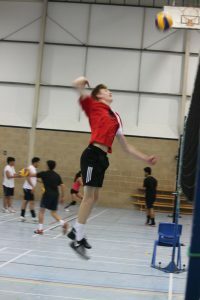 VK Barnet train every Wednesday evening from 8-10pm on two courts at QE Girls School, Barnet. The sports centre is is easily accessible, directly opposite High Barnet Tube Station and has free parking in the car park off Meadway. VK Barnet play in the Herts League with 1 team in Men’s Division 1, 1 team in Men’s Division 2 and a team in the Ladies Division. We also enter teams in both the ladies and men’s KO Cup. We are very lucky to welcome back to the club hugely experience coach Donald Deans who will be supported by newly qualifed Level 2 coach Eloise Beckles and Junior Coach Eric Hill. The club offer very competitive adult and concession membership packages as well as a pay as you go option. The first session is half price. For further enquires please email: secretary@vkbarnet.net or complete the contact form below and a member of the club will be in contact. Check with juniors@vkbarnet.net before attending.